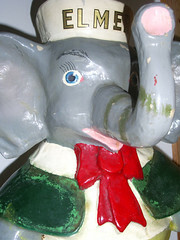 A few years ago, I shared my memories of Elmer the Safety Elephant. Elmer was a character who would visit my primary school back in the 80s to teach us about bike safety, not walking on train tracks and such. I just received the following email regarding Elmer the Safety Elephant. 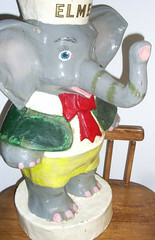 Hi Mike, just read your article on "Elmer the Safety Elephant". Excellent. I noticed a picture of the flag and Blinky, but none of the Elmer statues that used to grace our schools in the good old days. Just wanted to let you know that I am in possession of one of the original 8 statues (8 being the number of districts in the Toronto area at that time). I know 1 statue is in the police archives, and the rest are probably in safety officer's basements. I saved one from going into the trash as it needed some repair to the trunk and was to be disposed of. It is a beautiful sight to see, all original paint etc. 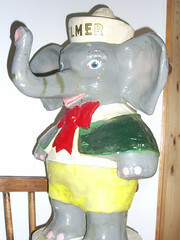 Here are pictures of this rare Elmer statue. The person who saved this statue wishes to remain anonymous, but he would like you to know that Party Boy DJ Services is "very good and in-expensive compared to most companies". Just remember.... safety first! Hey there. GREAT STORY! You wrote, "Elmer was a character who would visit my primary school back in the 80s to teach us about bike safety, not walking on train tracks and such." The 80's? I remember how proud we were to have an Elmer the Safety Elephant flag at our primary school --back in the 50's! And we'd have wonderful Constable Yakichuk delivering Elmer's wisdom. 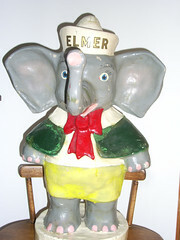 I remember Elmer from my elementary days of the mid 60's. I once entered a contest for a sitcom - Elmer was one of the characters. I'm happy he made it out of the dumpster. 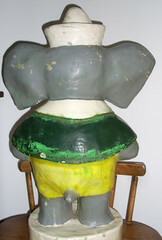 My brother-in-law is looking to buy an original Elmer the Safety Elephant flag. 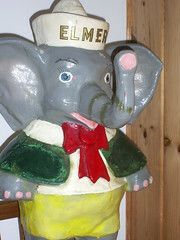 I have one of these original Elmer the Safety and I'm wondering how to sell him. I have the same statue in my classroom in great shape! I'm retiring and plan to take it with me. Many staff have asked me for it. I would donate it to a museum but not an individual. Any suggestions?